In serving online students, its often challenging to provide them with experiences that would normally require a physical or on-site presence, as is the case for online nursing students who need to master certain clinical competencies. 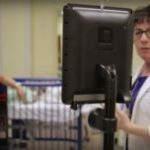 So in looking for solutions, Duke University’s School of Nursing is using telepresence robots as an instructional tool for advanced practice nursing students to engage them from a distance in high fidelity life-like clinical simulations. Have you ever seen a telepresence robot? It’s built on a giant wheel castor with an adjustable pole and an iPad mounted on the top, which uses video conferencing software to enable communication. Students can then remotely control the device using their tablets, computers, or smartphones maneuvering it around the room while panning or tilting the iPad screen and basically any direction. Manufactured by California-based Double Robotics, these amazing digital devices pave the way for students in Duke’s fully online Master of Science in Nursing program to work remotely with students in the university’s campus-based Accelerated Bachelor of Science Nursing program. And believe me, it’s a win-win on both sides. By creating a virtual physical presence, telepresence robots enable these online graduate students to develop their coaching problem, solving, and communication skills as they provide quality clinical guidance in patient care to undergraduate nursing students. 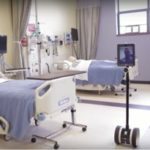 What’s more, as telemedicine becomes more prevalent these robots offer a unique opportunity for Duke’s nursing students to become fully proficient in the process. Empowering them to practice high-quality healthcare services without losing that all-important face-to-face patient connection. This very creative hybrid teaching approach has received accolades from Duke University students and faculty alike, while also capturing the 2015 Biota Award for Technological Innovation in Healthcare Education, an honor that Drexel University’s own College of Nursing and Health Professions is proud to facilitate. Quite often the difficulty in serving online students fully is to find alternatives to providing experiences that generally require a physical presence. Such was the case at Duke University School of Nursing (DUSON) with a program that required clinical simulations. Providing the clinical experience consistently for those who do not come on campus was a challenge. That is until Duke invested in robotic telepresence. The U.S. News and World Report gave Duke’s Master’s and Doctor of Nursing Practice programs a ranking of #1 in the US in its 2018 Best Nursing Schools report. The School offers master’s, PhD, and doctor of nursing practice degrees as well as an accelerated bachelor of science in nursing degree to students who have previously graduated from college. DUSON’s mission is to create a center of excellence for the advancement of nursing science, the promotion of clinical scholarship and the education of clinical leaders, advanced practitioners and researchers. Finding an innovative way to address their need to give online master’s students the clinical experience was a challenge. Online students are now able to have a virtual presence by remotely controlling one of the “DUSON robots” with their own device, which can be a tablet, computer, or smart phone. These telepresence robots are mobile and include a giant wheel caster on the bottom, a pole stretching to an adjustable height of 4-5 feet and an iPad mounted on top. Nursing practitioner (NP) students manipulate the robots and use video conferencing software to have a virtual presence. They can maneuver around the building, moving from room to room, and even pan or tilt the displays to see in various directions. Utilizing a telepresence robot provides an experience that rivals to having a face-to-face physical presence. California-based company Double Robotics is the manufacturer of the robot used. Jacqueline Vaughn, Margie Malloy, and Ryan Shaw, the innovators of the program, aptly named the first one JaMMeR, which is a play on their names. 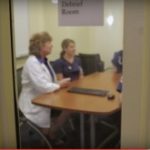 Duke uses the telepresence robots as an educational tool to engage nursing students with their advanced practice students. A requirement of the master’s program is that nurse practitioner students must attend clinical simulations with undergrad students and serve as a mentor. Using JaMMer makes it easy for the remote NP students to work with their Accelerated Bachelors of Science in Nursing (ABSN) students during clinical simulations. Through robotic telepresence, NP students have a virtual physical presence and are able to develop their coaching, problem solving and communication skills as they provide clinical guidance in patient care to the ABSN students. Duke provides two kinds or simulation environments; standardized simulations which are done with live patients who are paid actors and high fidelity simulator experiences which are conducted with computerized mannequins with sounds, heart beating, eyes blinking and other human characteristics. With connected monitors, the student feels as if they are in the hospital at the patient’s bedside. Prior to implementing the robots, NP students had to join the pre-licensure nursing students in person. Now telepresence robots allow nurse practitioner students to join online. Robotic Telepresence is a great way to give online students a virtual presence on campus enabling them to participate in live simulations.